An Ames room is a distorted room used to create an optical illusion of relative sizes. Named for its creator, American ophthalmologist Adelbert Ames, Jr., the first Ames room was built in 1946, based on the late nineteenth century concept of German scientist Hermann von Helmholtz. Upon viewing people or objects within an Ames room, there is a loss of normal perspective. As a result of the optical illusion created by the distorted room, a person standing in one corner appears to the observer to be significantly larger than a person standing in the opposite corner while the room appears to be a normal rectangular shape. This is taken to indicate the significant role past experience has on our interpretation of our perceived world. The founder of modern studies of perception, Hermann von Helmholtz, is credited with the concept of the "Distorted Room" in the late nineteenth century. Though he never constructed one, Helmholtz conceived of a room that, properly distorted, would look like a normal rectangular room. Helmholtz believed that perspective cues were often more powerful than stereoscopic disparity (the ability to judge depth based on the slightly different angles of vision from each eye) when it came to depth perception. Ophthalmologist Adelbert Ames was the first to construct an actual Distorted Room in 1946. Through constructing the room and experimenting with it, Ames went beyond Helmholtz's concept, discovering that familiar laws of physics could be apparently violated in a Distorted Room. In addition to the misperceived size of people, balls appear to roll up troughs when they should roll down. Ames was one of the first to discover the amount of power experience has on perception. Upon viewing people or objects within an Ames room, there is a loss of normal perspective. As a result of the optical illusion created by the distorted room, a person standing in one corner appears to the observer to be significantly larger than a person standing in the opposite corner. The illusion is convincing enough that a person walking back and forth from the left corner to the right corner appears to grow or shrink, and balls appear to roll uphill. An Ames room is constructed so that, from the front, it appears to be an ordinary rectangular room, with a back wall and two parallel side walls perpendicular to the horizontally level floor and ceiling. In reality, this rectangular appearance is a trick of perspective. The true shape of the room is trapezoidal: the walls are slanted and the ceiling and floor are at an incline, and the right corner is much closer to the front-positioned observer than the left corner (or vice versa). Observers look through a peephole into the room to create the best viewpoint and remove any sense of depth created by viewing the room with both eyes. The illusion is often enhanced by adding additional visual perspective clues, such as a checkered floor and "rectangular" windows on the back wall. There is nothing surprising in our perception of the empty room as normal, for the image we see through the peephole is identical to that which would be received from a normal rectangular room. However, when people stand in the room there is a conflict. 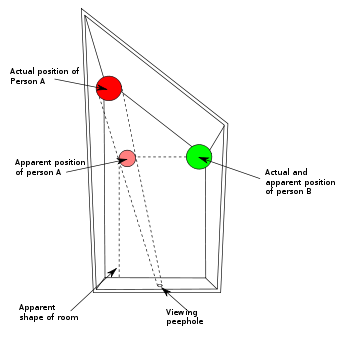 The person in the further corner has a smaller image, due to their greater distance from the observer as compared to a person in the nearer corner. What is surprising is that observers see the people distorted in size and the room retains its rectangular shape, presumably because we are used to seeing rectangular not trapezoidal rooms. Thus, an adult in the further corner will appear smaller than a child in the nearer corner. Ames and subsequent researchers used this phenomenon to demonstrate the importance of experience in perception. We favor the mistaken perception of a normal room and wrongly see the people as different sizes. Interestingly enough, an entire room is not necessary to create the illusion of distorted size; it is sufficient to create an apparent horizon against an appropriate background. The eye then relies on the apparent relative height of an object above that horizon. A type of selective perceptual distortion known as the "Honi phenomenon" causes some people to perceive less size distortion in an Ames room. The original experiment involved a husband and wife; the wife perceived less size distortion of her husband than she did a stranger, because of the love and respect she had for her husband. Similar results were obtained when navy recruits were shown naval officers and recruits; the authority figure was perceived to be less distorted. This shows that the mental attitude of the observer to the subject perceived can alter perception, whether it is positive (like love) or negative (like fear). The Ames room has made several appearances in film, including the 1971 Willy Wonka and the Chocolate Factory. Other films, like The Lord of the Rings trilogy, used Ames room sets instead of digital special effects to create the illusion of the hobbits as small compared to the humans and other characters. ↑ Gregory, Richard, Eye and Brain. 1997. ↑ Wilson, Colin, Introduction to the New Existentialism. Retrieved October 22, 2007. p. 69. Dion K.L., Dion, K.K. “The Honi phenomenon revisited: factors underlying the resistance to perceptual distortion of one's partner.”Journal of Personality and Social Psychology. Vol. 33. Issue 2. p. 170-177. 1976. Ittelson, William H. The Ames demonstrations in perception: A guide to their construction and use. Princeton University Press. 1952. Morris, Errol. Van Hoogstraten's Peep Show or Ames's Room? Steele, Kenneth M. Diagram of an Ames Room. This page was last modified on 14 March 2016, at 15:23.